In my neighborhood, a block away from my house, there's a little "Vest Pocket" park. I've spoken of it before, it is named after one of the more entertaining people that I have met in this town, M.E. DePalma. On an Island of entertaining people, to be at the top of that particular list is indeed a feat. The other day I was walking Mrs Dog past the park and there was someone weeding the park, and a dog tethered to that ugly FPL Fibrenet warning post that they put there so I started to weave into the park. Being horrible with names and not seeing his face, I walked a wide circle around the person manicuring the ground cover past the remnants of the Mexican Milkweed and toward the far part of the park so as to let the very friendly golden retriever have her space. When I passed he looked up and looked familiar, and being abysmal with names, I knew I knew him but was admittedly sheepish. I had passed him and was on the way out of the park and ran into M.E. DePalma getting ready to do some more weeding. She and I were talking about various City events and we both commented on the Milkweed. 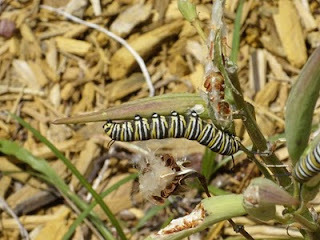 There are so many Monarch Butterflies in the neighborhood that those plants are constantly down to stumps. Skip, Her Partner, and the person who was on the other side of the park was saying at a loud voice "Go away Butterflies, let those plants grow!". Amusing and ironic that in a butterfly park you have a problem with too much of a good thing. My Milkweed on the other hand are doing quite well. The monarchs are finding that the butterfly park has tastier nectar and pollen and are laying their eggs there while flying through my yard to get there. I sit in my living room and can see a parade of monarch butterflies float past the front window on the way to the park. We've got a good thing going there. It was a property that was too small to be "economic" to develop, and given to the city for this park. I'm glad it is there, and so are the butterflies.